Guar gum seed has emerged as major agriculture farm produce exported from India during last four five years. 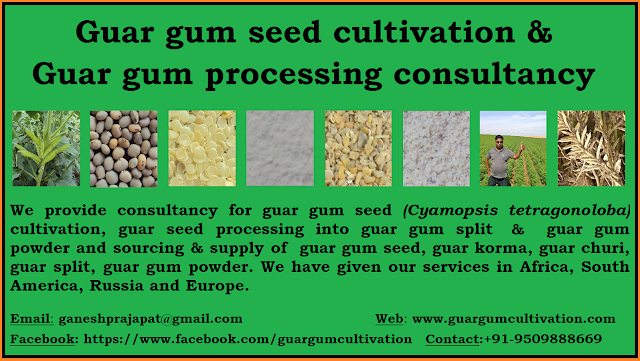 Guar gum seed is cultivated in India since centuries. It is a drought resistant crop. Traditionally Guar is produced / cultivated / in Rajasthan but since last three years Guar gum production / cultivation / farming area has increased in neighboring states. Gujarat has emerged as major Guar Gum Seed growing / production/ cultivation/farming state in India. Climatic and geographical conditions of Gujarat is similar to Rajasthan and located in same guar gum seed production/ cultivation/farming belt which start from Haryana continue in Rajasthan, Sindh region of Pakistan and scattered up to Gujarat. Gujarat is located on seashore. Infrastructure in existing port has developed and Govt has developed some new port, due to these geographical opportunity guar gum exporters are establishing new guar gum processing industries are developing in Gujarat, as inland transportation from guar gum processing unit to Sea-port comes down, it saves both money and time for guar gum exporters. 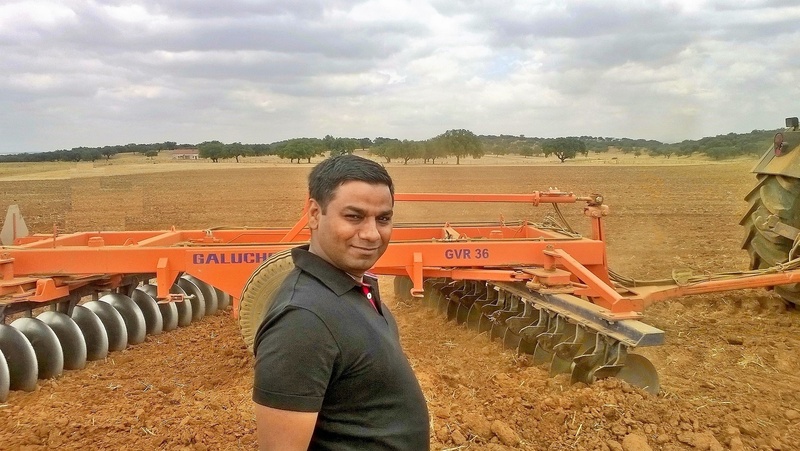 These new industries are attracting Gujarat farmers for Guar gum seed farming /production / cultivation in State. 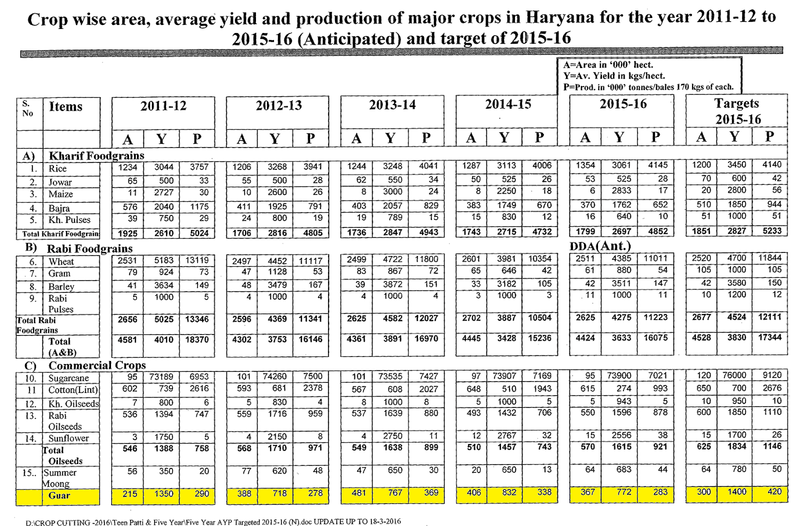 Gujarat govt has released third estimate of area /yield/ production of major crops. As per these statistics guar gum seed was cultivated on 3,18,000 - Hectare area, Total guar seed production from Gujarat state was 1,91,000 MT and average yield of guar gum seed was 602 Kg/Hectare. Though Guar seed and guar gum rates are slowly and slowly improving in spot market and future market but still it is not attracting much farmers due to more profit in other crops. Guar seed is also a major groundnut, cotton and castor growing state of India. If farmer will better opportunity guar gum seed, then they will go for Guar gum seed cultivation. Otherwise in Irrigated belt Rice, Cotton and Groundnut are major crop ; in rain fed area Guar gum seed will face tough competition from Kharif pulses. 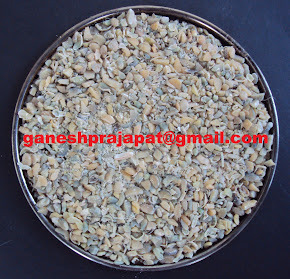 Hrayana is an important state for guar gum seed production in India. This is highest productivity or yield per hectare among all states of guar seed production. Most of Guar/ Gwar/ Gvar gum seed production in Haryana state comes under irrigated conditions. Quality is also considered good as crop develops under good cultivation condition. Most of time irrigation water is available in adverse climatic conditions. In Haryan there are some good guar gum processing industries and guar gum powder exporter. 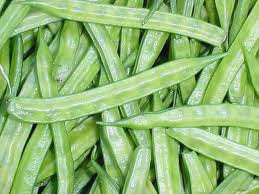 Rate of guar gum split of Haryana origin always remain high in market due to superior quality. 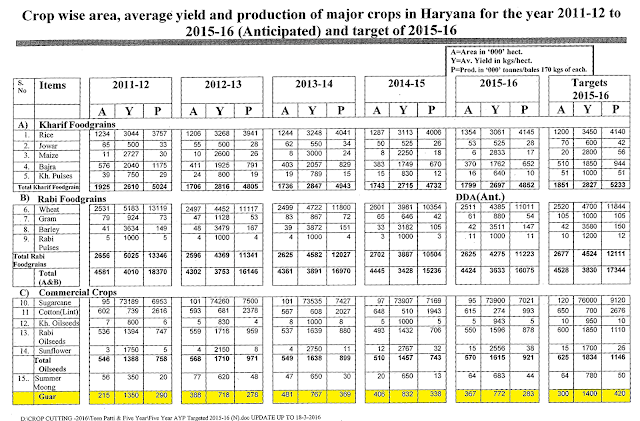 Haryan govt has released advance estimate data of crop production data for year 2015-2016. During this year guar gum seed was cultivated on 3,67,000 hectare Area and production of guar gum seed was 2,83,000 MT and average productivity remained 772 Kg/ Hectare. This year Haryana govt targeted guar cultivation in 300000 Hectare area targeted yield was 1400/kg Hectare and total 4,20,000 MT guar gum seed production was targeted. 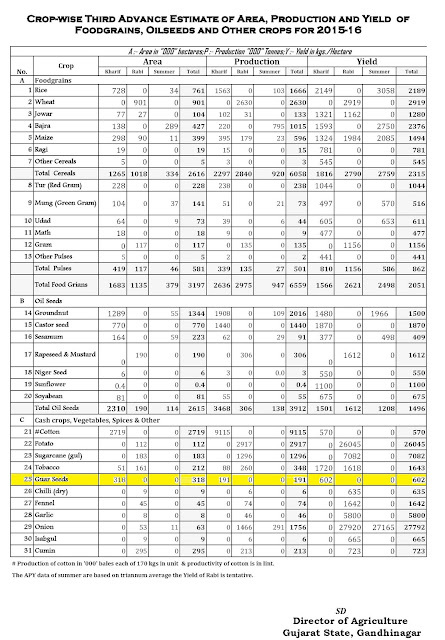 Advance Estimate of Guar gum seed production from Haryana ( India ) in year 2015-2016. 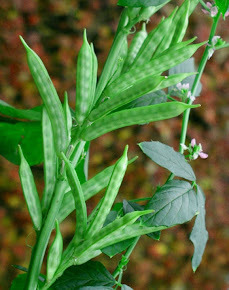 Production of Guar seed was remained lower than last year . In Haryana last year ( 2014-2015) guar was cultivated on 4,06,000 Hectare, average productivity of guar seed was 883 Kg/ Hectare and Total production of guar seed was 3,38,000 MT. It was recorded that in this year crop was damaged due to drought in cropping. 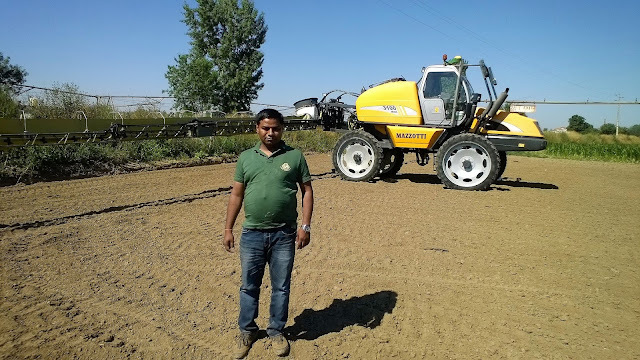 If the rate / bhaw of guar gum seed will remain below INR 5000/100 Kg then it is predicated that farmer will prefer other crops over Guar crop, like Rice, Cotton, Maiz, Jowar Sugarcane specially in irrigated area, in rainfed area farmer may prefer, Moong, Jawar (Sorghum), Bajara ( Pear millet). Advance estimate of Guar seed production from Rajasthan in year 2015-2016. Rajasthan Govt has released estimated data of crop production in the state during 2015-2016. 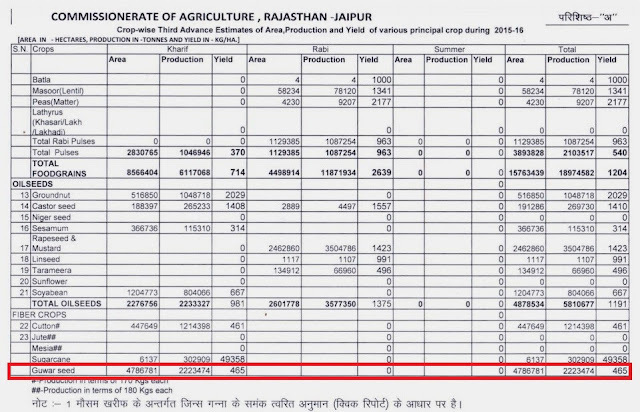 As per these data this year there was 2'223'474 MT guar seed production in Rajasthan, which was cultivated on 4'786'781 Hectare Area. Average productivity of guar seed from Rajasthan was 465 Kg/ Hectare. This year ( 2015-2016 ) there was lesser production than year 2014-2015. There is pressure of crude prices on guar seed rates in local market. If this pressure from crude prices will remain continue then farmer may shift to other profitable alternate of gaur seed. This alternate might be other pulses crop like Moong or Moth specially in rain-fed area. In irrigated area farmer may shift to other alternate like groundnut, sugarcane or Cotton. Guar is still a profitable crop for farmers but high prices of other alternate crop may force farmers to rethink about guar. As per data released by ministry of Agriculture USA remained top destination for Indian Guar Gum powder for year 2015-2016. After USA; China,Germany , Russia, Canada, Italy, Lithuania , Argentina and Brazil remain top 10 countries as importer of Indian Guar gum powder. Japan, United Kingdom, United Arab Emirates, Spain, Switzerland, Australia, Netherland, Indonesia, Norway, Thailand, Turkey, Greece, Belgium, France, Denmark, Mexico, South Africa, Korea Republic, Poland and Chile remain other important country for Guar gum export. Indian exporter of guar gum powder prefer to deal with top 10 countries, USA remains their favorite destination for do the business. Some of Indian manufacturers have established their companies in USA and storing the Guar gumn powder in USA ware houses. In this module there is no fluctuation in rates of tension of quality of of material and consumption of time in shipping. Buyer have option to negotiate price, test of quality and payment against material. Last year USa was consuming more than 65 % of Indian Guar gum powder. But due to low crude price the consumption of guar gum powder in fracking activity has come down. Though these data are only up to January. Data of February & March will be released shortly by govt then actual picture will come. as per these data, there will be minor correction in overall situation. As per the data released by Ministry of Agriculture, India, export of guar gum is increasing slowly and slowly during year 2015-2016. Currently data are available only up to the January-2016. In January 2016 there was export of 38,258.75 MT of Guar gum of USD 417,637,915 ( More than 417.6 Million USD) . Quantity wise it was highest export in January 2016. This is a good news that overall export is sustained at a particular level. The total export of guar gum during year 2015-2016 will be remain lower that year 2014-2015. but the exact situation will come out after release of data of February-2016 and March-2016.